Possibly what Egypt is most famous for is it pyramids. Though there are pyramids in a number of different countries Egypt is most famous for theirs as they are the world’s only ‘true’ pyramids (pyramids with flat sides). There are over 100 pyramids in Egypt all over 4000 years old. The pyramids were created during the Old Kingdom between 2700BC and 2200BC. 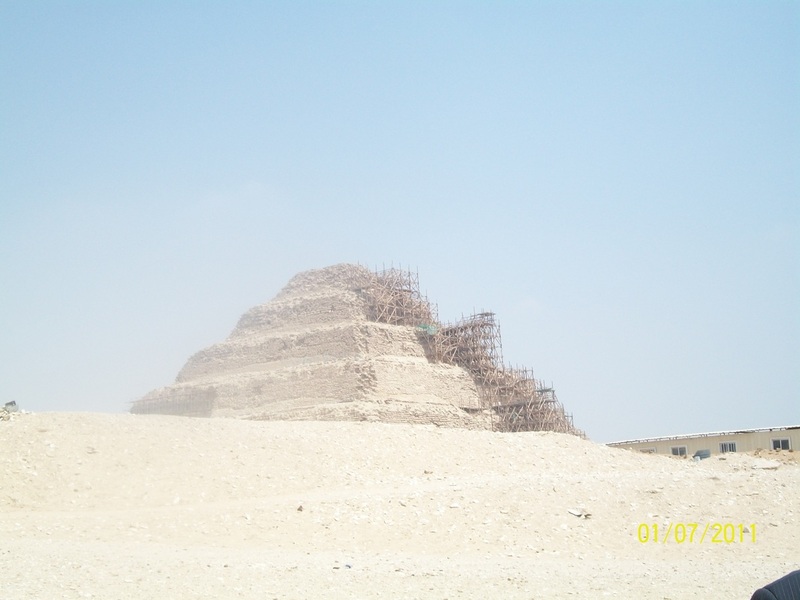 There is variation between the structure and design of earlier pyramids to later pyramids. leading up to the top, over time they grew more sophisticated and the latest pyramids are shaped like square pyramids, with flat sides. These types of pyramids are known as ‘true’ pyramids and Egypt is the only country in the world to have them. The Great Pyramid of Giza is the oldest of the three pyramids at the Giza Necropolis and the only of the Seven Wonders of the Ancient World still in existence. Khufu's pyramid is an example of a true pyramid and it was built for Pharaoh Khufu and constructed over 20 years in approximately 2550BC. There are 3 chambers in Khufu's pyramid; the first chamber is the foundation for construction and the other two are where the King (Khufu) and the Queen (his wife) are buried. This pyramid is the only pyramid to contain ascending and descending passages. It was the tallest man-made structure for almost 4000 years until the 12th Century when the Lincoln Cathedral in England was built. The Giza Necropolis is home to two other larger pyramids the pyramids of Khafre and Menkaure as well as a number of smaller pyramids for the queens and the Great Sphinx. The Great Sphinx is a limestone statue with the body of a lion and a head of a man. 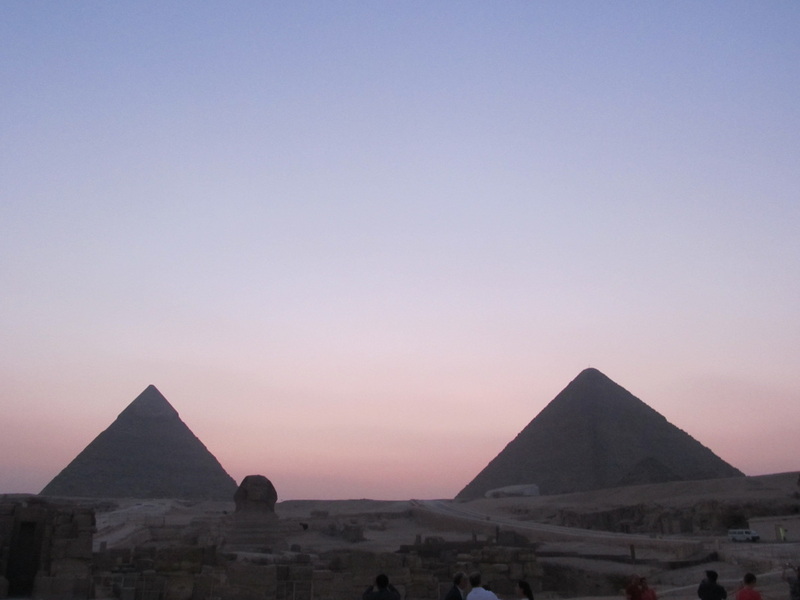 It was created for the Pharaoh Khafre to guard his pyramid, which stands directly behind it. The Sphinx's was covered by sand for thousands of years and only uncovered in the past 200 years. 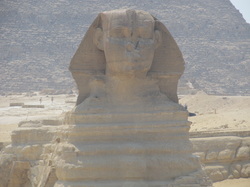 It is clear from just looking at the Sphinx that its nose is missing. The story that Napoleon or one of his soldiers shot it off is a total myth as the Sphinx's face would have cracked and there would be more damage. The most likely scenario is that the nose simply fell of due to its age. The Sphinx is the oldest monumental sculpture and the largest monolith statue in the world.